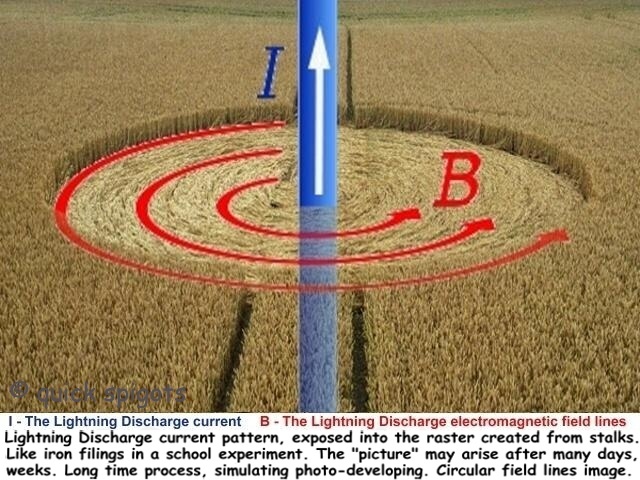 Crop circles - Dual discharge effect. Explanation, decipher, decode, discovery, break code, explaining, decryption, puzzle out, scientific research. 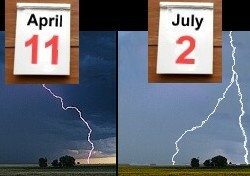 In some cases is possible, that regular pattern arises due to combined effect of two completely independent Lightning Discharges, during two different storms separated by many days period, even several weeks. During the second, later storm one or more lightning discharges hit the same place, maybe there appear a discharge system consisting of the first and several subsequent discharges + their parallel arms, among them are created a variety of mechanical and electromagnetic interferences. Hits the field on which was some time ago created a large irregular area of damaged grain (at least several hundred square meters), although still not lodged (damaged, weakened), which is due to the previous electric damage weakened, withered, and so much more sensitive to any mechanical intervention, than the system of undamaged and healthy plants. 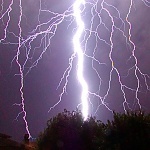 It is then possible that in the case of only mechanical impulses from the second lightning discharge, and their interferences and resonances, affected crop stalks remain immediately and definitively lying (of course, in most cases, though not entirely without exception, the stalks just above the ground only bent, not broken). Immediately after complete bending to ground within a few minutes will cause effect of negative geotropism, less also phototropism, and nodes, that were during lodging (damaging, weakening) and only several minutes after that totally unchanged (straight), will begin to do their work. It is one of the tasks, to which are their meristems determined, in addition, for example to lengthening of internodes, and successfully perform it for millions of years. Because almost never they are such flattened (damaged, weakened) structures discovered immediately after lodgign, completely always any observer is bound to discover on them bent and extended nodes. The rate of their deviation from normal state depends only and only on the time, elapsed since lodging (damaging, weakening), absolutely never and nowhere to anything else. No damaging energy, no evaporation of water (ala "exploded nodes"). By the way, to the fact that inside any plant was evaporated such only a minimum amount of water, that would ne able to cause such a little mechanical damage, the whole plant would have to receive such a great quantity of energy, that would totally complete kill the entirely plant (more precisely a multiple of that amount), and after a few days, when the pattern is discovered, would be not possible to find even a slight rest of that. A more detailed analysis of the energy balance necessary to the creation of "exploded nodes" and electrical or thermal energy, that is able a certain quantum of live plant material damage or kill, including quantitative calculations and experimentally elaborated evidence, will be presented in section Physics. What Crop Circle explorers for decades quite erroneously termed as exploded nodes (expulsed cavities) in fact arises as very slow and completely natural growth changes of maturing plants, kdy se zprvu zcela neviditelné mikroskopické změny tkání (ripening and slowly withering down) gradually changing very slowly to macroscopic, visible changes. In the case of nodes bending mainly due to geotropism (negative), slightly less phototropism, but never by any activity of any energy at all. These may because of the different mechanical properties (hardness, strength, flexibility) immediately adjacent tissues interact with each other, and partly mechanically damaging each other, but with no negative consequences. Damaged and withering remain only plant parts that have not at least negative effects on continuing growing and ripening, they are just only a natural consequence of it. It will be elaborated as much more detailed, including photodocumentation of natural growth changes in plant tissues without any supply of any energy on the page Biology. At least two cases of finding structures of lodged (damaged, weakened) plants, that followed immediately after their bending to the ground were described in past. 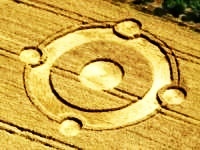 One of them is the Julia Set near Stonehenge (1996), and the other is the case described in the film Mayan Prophecies and Crop Circles – An Extraordinary Connection, where is observed and described progress of creation pattern known as (a year, photo). Incidentally, in that film observers even saw incoming, probably the second lightning discharge, but all failed to adequately evaluate what was actually happening there. Although, objectively speaking, the lightning discharge, noted by them, would not be all that same, that was "painting" all that picture, could no longer be just a pulse, acting as Butterfly, and triggering knock-on process of the Domino Effect. V obou případech jistě pozorovatelé po příchodu na místo nalezli stébla a jejich kolénka přesně ve stavu, který odpovídal době od pozorovaného počátku of their bending down. If there were found some stalks with significantly altered nodes, these were certainly a very exceptional cases, completely outside of any statistical probability, that were located there in such a modified state for many days before, caused by some completely different accidental reasons. In the first case (Julia Set) had to be the stems straight and nodes almost unchanged, in the latter case a slight deviation could occur, corresponding to the elapsed time (several hours passed until the morning). One of the reasons why sometimes during different storms two lightnings fall repeatedly in almost the same place may be a quite common coincidence. Average number of lightnings in Czech Republic is 2 to 4 per square kilometer yearly. In locations where crop circles appear at most (Britain, Italy, quite often they found also by former comrades from GDR - East Germany, DDR - Deutsche Demokratische Republik), this number will not vary significantly. For two lightnings of different storms landed in no more than some 10 to 30 meters apart, it must already be quite a coincidence (but possible count how often it may come about, and here will be a result). In some cases it may be completely nonrandom phenomenon. Discharges may be repeatedly attracted to the same place for various reasons, both natural or industrial character. As will be further explained briefly, and in much more detail on another page, not only in a small part are likely to participate as the main cause reasons of archeological character, also Geology may very strongly participate. 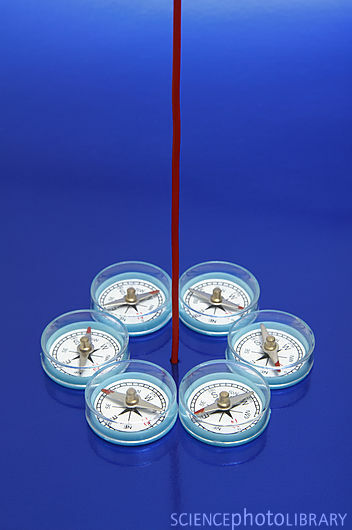 Also possible refer to Dowsing - sensitive individuals may feel on the site many sorts of things. They do not realize at all, that among other things, their senses may respond very strongly to any underground structure, for example, just geological or archaeological character. As already mentioned for example here (monkeys), similar studies on any of such sites is strictly necessary to completely eliminate from any objective research. In addition it seems much more likely, that dowsers in fact much more respond to any on-site and located (fortunately just only temporarily) Toxins, and would rather have take there canary-bird in a cage, low down to earth.